Lovely deal this week from Gwen Delicious! You have a choice of 4 popular items from her shop! Especially love that secret note capsule necklace! 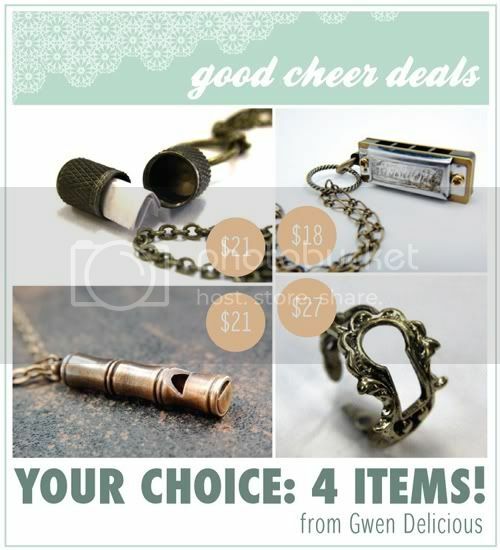 Good Cheer Price: $21 with free shipping & handling! Good Cheer Price: $18 with free shipping & handling! Good Cheer Price: $27 with free shipping & handling! - This deal is open to all countries! Free shipping & handling toUSA, Canada, and anywhere in the world! - 15 of each item available! receipt on average of 12 days. - Please be sure to visit Gwen Delicious and support! Such clever ideas! Very interesting pieces. That harmonica is so sweet! The harmonica is fun and so cute and tiny! Love it!